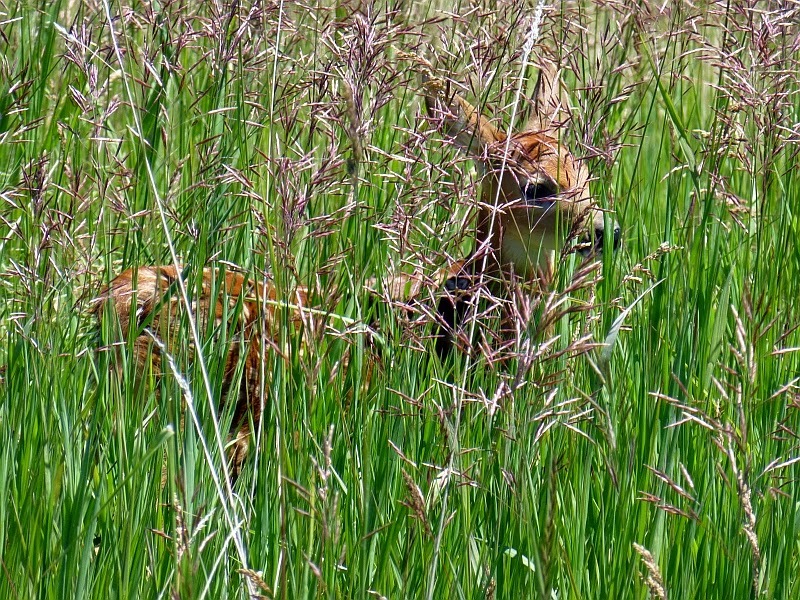 This is the time of year -- if we're lucky -- to see fawns. As a neighbor said, there is certainly no animal more beautiful than a baby deer. I haven't seen many fawns this year (they're out there -- I just haven't seen many) but on Monday I was fortunate to see two in a row. 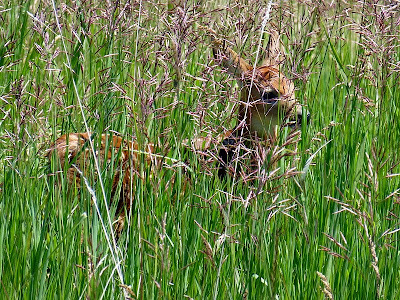 On my way into town, I came across this mama with her baby almost hidden by the tall grass. Despite mama's alert stance, the baby decided it was time for a snack. Snack time over, off they went. ...who hastily scooted off the road. I tell ya, it's always worthwhile keeping your camera handy! You never know what you'll see! OOOO....I just love little fawns! I haven't seen one yet at all this year. When they're alone in a picture, it's hard to tell how small they really are. Their proportions are just like an adult deer. (Not like a foal that's all legs.) It's only when they get up close to mama that you see how tiny they are. So darn cute! They're beautiful birds, even though I have to fight them for every single last juneberry! "I tell ya, it's always worthwhile keeping your camera handy! You never know what you'll see!" It's always worthwhile for us for YOU to keep your camera handy! I don't know how you catch these snippets of life but I truly do appreciate them Lady Lewis! This is so gorgeous, I set one of these pictures as my desktop background. What a little piece of heaven! I enjoy coffee on my east deck and love to get up early enough to catch the sunrise. One morning, in the grey twilight, we watched our old cat, Josie, nose around a doe that had bedded down less than 30 feet from us. The doe got up and "nosed" Josie, literally, away. Josie sat and watched from about 10 feet away as the doe again lay down. It was then we realized she was blessing the world with a fawn. As the sun came up, we witnessed this miracle. Josie, our substitute mother for all animals, got a little closer. After about 30 minutes both mama and baby were up, but they only moved a few feet into the taller grass of the neighbors pasture. We finished a pot of coffee while baby figured out the world and eventually headed for the wooded areas. Ordinarily deer our not our favorite animals, having caused literally thousands of dollars of damage to trees, shrubs and our garden. 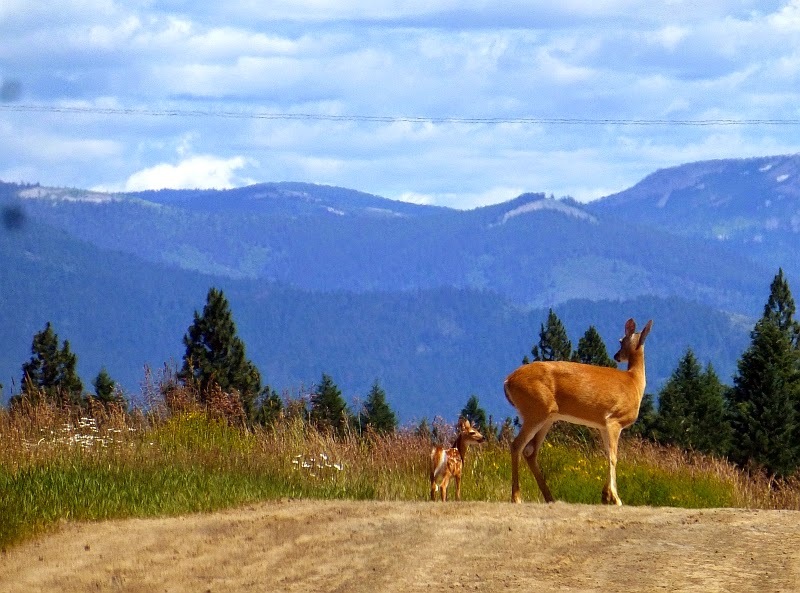 The white tail deer here are a mistake, brought in my Fish and Game, only to cause the mule deer to head for the hills. Because the deer are overpopulated, they are scrawny and sickly. Last year hunters could take SEVEN. Unfortunately, animal rights-bots live in our town and they feed and shelter them, especially during season. More than one unsuspecting person has had their sternum cracked by "pet" deer that someone habituated to humans. Children have been chased in the park across from us. We have had to defend our own picnics from them. However...they are truly beautiful creatures and certainly picture worthy. Thanks for sharing. Our closest calls with deer are in our own driveway! The other day I witnessed a mama with not one, not two, but three babies! It was truly an amazing sight. Our conservation department has allowed severe harvest of does in an attempt to get champion bucks. Doesn't make sense, right? 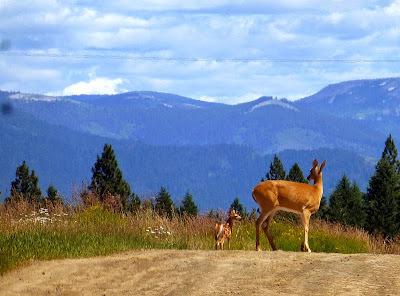 Now our deer population is down, which is why I probably saw a mom with a set of triplets!